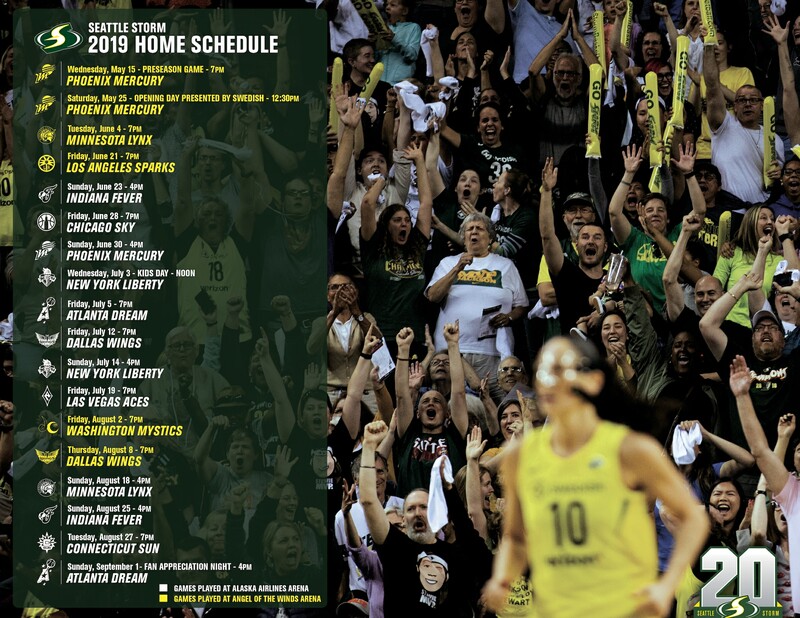 SEATTLE – The three-time WNBA champion Seattle Storm today announced that single-game tickets for the 2019 campaign are available for purchase. The general public can secure seats beginning at 10 a.m. PT by visiting StormBasketball.com. The team will begin its title defense facing the Phoenix Mercury at Angel of the Winds Arena in Everett, Wash. on Saturday, May 25 at 12:30 p.m. on ABC. Opening Day presented by Swedish will feature a ring ceremony celebrating the franchise’s third WNBA title. Sue Bird, the league’s all-time leader in assists (2,831) and games played (508), will begin her 17th WNBA season as point guard for the Storm. Seattle will also welcome back 2018 WNBA MVP and Finals MVP Breanna Stewart, the league’s second-leading scorer last season at 21.8 points per game; 2018 WNBA Most Improved Player Natasha Howard; and 2018 All-Star guard Jewell Loyd. Due to Seattle Center Arena renovations, the Storm will host its May 15 preseason contest and five regular-season games at Angel of the Winds Arena in Everett, Wash.; all other home games will be played at the University of Washington’s Alaska Airlines Arena, where the Storm will debut on Sunday, June 23 at 4 p.m. vs. the Indiana Fever. Including Seattle’s 2010 and 2018 titles, the first four Storm home games will feature the five teams that have combined to win the last 10 WNBA championships. Kids Day will commence Wednesday, July 3 at noon as the Storm hosts the New York Liberty at Alaska Airlines Arena. Inspiring Women Night presented by Symetra will take place at Alaska Airlines Arena when the Las Vegas Aces visit Seattle on Friday, July 19 at 7 p.m. It will mark the Storm’s final home game before WNBA All-Star 2019 on Saturday, July 27 at the Mandalay Bay Events Center in Las Vegas. The 2018 Finals rematch vs. the Washington Mystics is set for 7 p.m. on Friday, Aug. 2 at Angel of the Winds Arena. Fan Appreciation Night will tip off on Sunday, Sept. 1 at 4 p.m. at Alaska Airlines Arena vs. the Atlanta Dream. The Storm holds the No. 12 overall pick in the WNBA Draft 2019 presented by State Farm, which will take place tonight at the NIKE New York City Headquarters. Coverage of the first round begins at 4 p.m. PT on ESPN2 and will also stream live on the ESPN app. Raise the trophy with the Storm in 2019 with a Storm 360 Membership, ticket package or group experience, available by calling (206) 217-WNBA (9622).